When you come to Hobe Sound it just “feels different”. Everything slows down. Even motor traffic on Florida’s infamous U.S. Route 1 is less crowded. Big box stores are nowhere to be seen and folks shop local. Parking at the beach is free and main street is lined with small, independently-owned shops—many with murals painted by local artists and Jimmy Stovall, one of the original Highwaymen of Florida. RVers coming up from the Florida Keys using U.S. Highway 1 (the scenic route) motor north through the congestion and craziness of Miami and the Palm Beaches before finding a certain quietness somewhere around Tequesta, just north of Jupiter’s historic lighthouse. Beyond County Line Road, it’s a pleasant 55 mph through the 11,000+ acre Jonathan Dickinson State Park on your left and snapshot views of the Intracoastal Waterway on your right. This is Martin County, with its beautiful beaches and more than 75 parks, and the most diverse lagoon ecosystem in the Northern hemisphere. At the crossroads of Hwy 1 and Bridge Road, you enter Hobe Sound and step back in time to the days of Old Florida and a slower pace of living. Just a few blocks north of Hobe Sound’s only waterfront restaurant (when it rains) Harry & The Natives, you’ll find Floridays RV Park. If you discover Hobe Sound from the north through Brevard County, US 1 wanders through the lower section of the Indian River Lagoon Scenic Highway and winds along the tree-lined streets of Sebastian before entering St. Lucie County, famous for it’s fabled 1715 Spanish treasure fleet that sank off its shores. Further south, Hwy 1 crosses over the St. Lucie River into Stuart, the largest town on the Treasure Coast and known as the Sailfish Capital of World. Arrive on a Sunday morning to check out Stuart’s quaint downtown and Sunday morning Green Market. 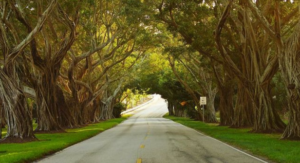 Coming from the west, RVer’s want to take Martin Highway (County Road 714) with it’s beautiful 12-mile Martin Grade Scenic Corridor shaded by a canopy of 100-year old oaks and surrounded by pastures, groves, swamps and woods that are the perfect prelude for the timeless nature of Hobe Sound. We’ll keep the lights on! Learn more about Hobe Sound’s history and imagery at Florida Living Realty.